Does your best friend drool? Is it embarrassing to meet people and notice your friend has spittle overflowing the sides of their mouth? Are you constantly grabbing napkins to help keep yourself from being slobbered? We ARE talking about your dog, right? Let's face it; Drool Happens! It seems that I have an unusual attraction to dogs that drool. Tucker, our Golden Retriever was a world-class drooler. I have been in the habit of carrying a towel or rag around with me for years. Bentley followed in his best bud’s paw prints and is a champion drooler in his own right. Even though I’m not fazed by excessive “sugar” dripping from my dog’s mouth, many people don’t find it attractive. There is no accounting for taste! The problem with all of my drool rags is they are not convenient. I have to tuck them in my pocket or search for one inside my doggie purse. Drool waits for no human. If I don’t react quickly, I run the risk of the dreaded drooling head shake. Objects several miles feet away are in jeopardy of being slimed. Speed is of the utmost importance when dealing with a drooler. As you can tell, I take my drool protocol very seriously. What the world needs is a drool towel that is cute and easy to grab. my Frackin' Cute Tote Bag! Would I give you a problem with no solution? Of course, not! I was whining talking about the problem with a good friend of mine. Jamie is one of those people that can make any craft project look easy. You know the one that actually makes the things on Pinterest! She has made me some incredible things through the years and I love them all. Visit her Frackin' Cute Designs Facebook page and you can see many of her fun shirts and projects. She does an amazing job monogramming baseballs. I asked her about making a drool rag that had a clip for my belt loop, dog purse or Bentley’s leash. A week later I received a text from her and she had made me exactly what I described. She totally rocks! These towels are the perfect size and I love the fact that I can hang them on anything! I know several drooling friends that could use a Frackin’ Cute Drool Rags for Christmas. At only $15 each, a personalized gift is just what I need to check-off all of the dog parents on my list. Are you in love with a drooler? There’s a towel for that! You can rule the drool with these towels! 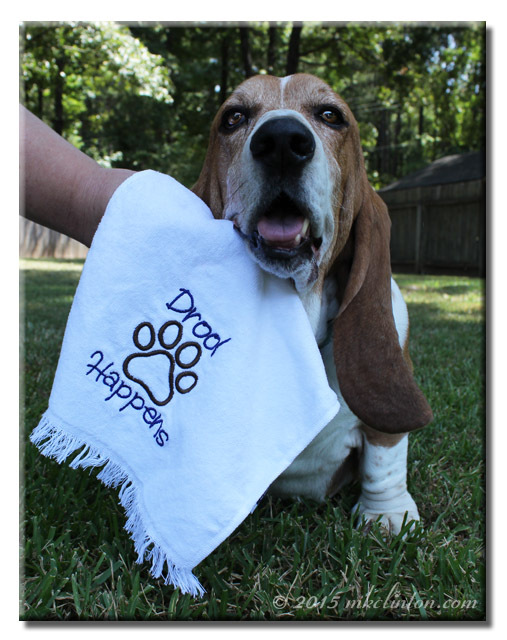 We are going to give away a Frackin’ Cute Drool Towel to one lucky reader! As always, we make entering super easy! Follow the prompts on our Rafflecopter giveaway. Good luck and remember DROOL IS COOL! Our bassets were world class droolers - Sam could sling spit right to da center of his forehead! LOVE THESE!! Omg, so adorable! You have the best giveaways I swear lady! Hehe, drooling at treats, oh yes thats funs...makes the peeps move a bit quicker! These are genius! I also think they'd be great to keep clipped in the car so it's handy to wipe muddy paws with after! 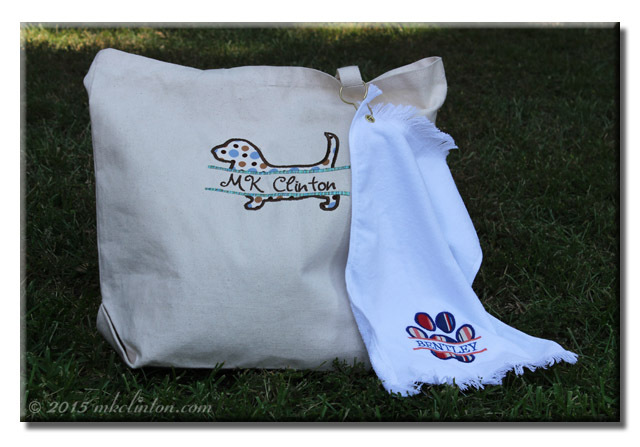 Our two don't drool --- but their faces do get covered in slobber when they chase a ball at the park-- these towels would be great to clean their faces -- we usually just carry a towel - but have to shove it in a pocket-- love the hanger these towels come with! These are adorable and I'm always looking for something to help with the drool! OMD how cute is this???!!! Have to check out this site for sure!!!! That's right! Those towels are awesome. What a cute idea! Those are really nice. I'm a lady, so definitely not my name and frankly, I don't drool...BUT Bailie drools every morning while waiting for breakfast, so I would get her name on one and give it to her! I've never had a dog breed that drooled. Am I missing a doggie experience? Those are so cute! Our girls rarely drool; Luke drools a bit more, usually just when waiting for supper or a special treat though. What a great idea! 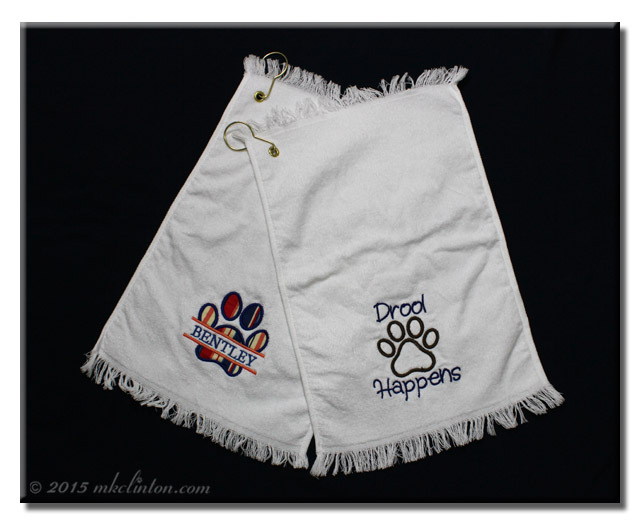 Even if you did not have a drooler - a towel would be handy for wiping wet or muddy feet! Those are brilliant! Laika doesn't drool nearly as much as my last dog, but boy she gets going when it starts lol. Those are great. Kilo doesn't drool much but I do need to wipe his face quite often. Those look great! I grew up with Mastiffs, and I remember always having a drool rag on every person in the family. When I got my own dog, my biggest requirement was a tight, dry mouth, hah! We don't drool much (y'know...cats rule...dogs drool!) but we think those are darn cute! We don't need any drool towels but we do think they are cute. Your friend is very talented, that tote bag and towels are really nice! Thank Dog my girls do not drool - I am not a fan of the drool!